If Google’s most trending beauty search in 2018 (“how to apply magnetic lashes”) is anything to go by, the beauty industry’s obsession with all things eyelashes is showing no sign of stopping. Considering how difficult it is to master the art of applying and removing false lashes without pulling your real ones out, it's no surprise that magnetic lashes are so popular. After all, the idea of sandwiching your lashes between two magnetic strips sounds relatively easy and painless, doesn’t it? While the innovative lashes may sound like a magical beauty hack, the application turns out to be no easy feat. With the help of Hong Kong makeup artist Becky Kwan, we put magnetic lashes to the test. Continue reading to discover the best tips and tricks to amp up your lashes like a pro. Add a light coat of mascara to add thickness to your natural lashes before applying the magnetic lashes. This step creates some grip to hold the magnets in place, especially for those who have little to short natural lashes. The magnetic lash bands can be flat and stiff when you take them out of the box, which can cause the corners to lift up when applied. Wiggle the lash bands back and forth with your fingers to soften it up and make it more supple for easier application. Instead of staring into a mirror straight-on, place it under your face at a perpendicular angle and look down at it. It'll almost be like having your eyes are closed, except this way, you can see exactly whether you're placing the strip close enough to your lash line. When working on your right eye, hold the outer edge of the upper magnetic lash with your right hand and inner edge of the bottom lash with your left hand, and vice versa. Hover the upper lash on top of your natural lash and the bottom part underneath your lash, as close to your lash line as possible. Once it's lined up properly, the magnets will snap together. Check yourself in the mirror to make sure that the lashes are secure and in place. 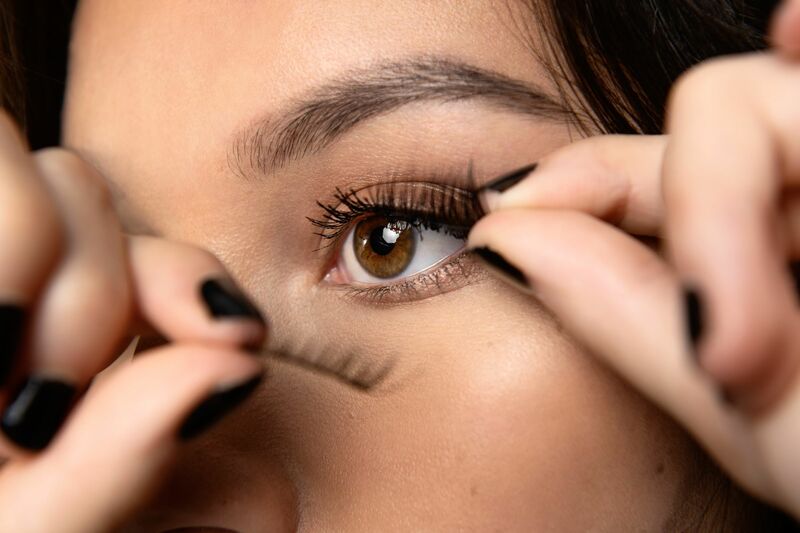 Adjust them if necessary to line them up with your natural lash line, and you're good to go.